Within nine minutes I was out the door and on my way. 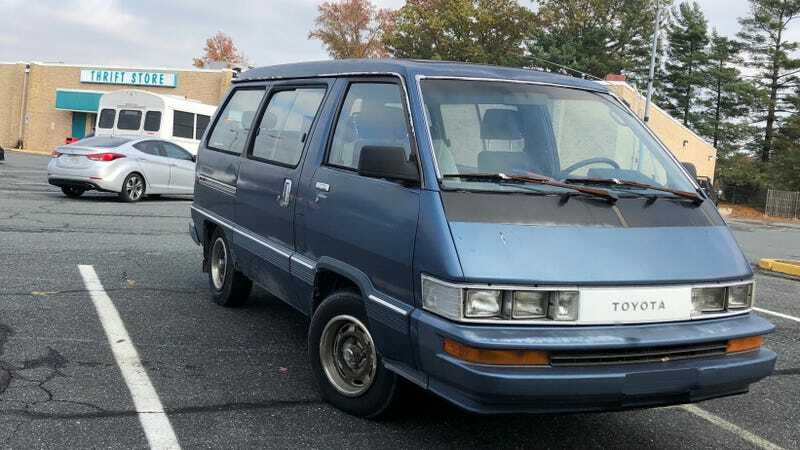 I was greeted by a faded blue second generation Toyota Van. I never found the owner but I managed to get a few pictures of this magnificent blue box. Toyota’s naming conventions for their models that were sold in the United States were not that inspired. The rest of the world got the Toyota HiLux and we just got the Toyota Pickup. This van specifically was called the TownAce and in Japan had all manner of wild names that looked like a thesaurus full of adjectives threw up all over the side of a small cargo truck. For example, this line of vans had a model called the Toyota MasterAce Surf van. Is it good for surfing? Probably not. Am I going to strap a bunch of surfboards to the roof and get myself trapped in the sands of Ocean City, Maryland with a cooler full of generic Sprite? Absolutely. This van unfortunately does not have the giant “4WD” graphic adorning the side and that’s a shame because I am a fan of ostentatious typography and vans that have better off-roading ability than some trucks. Overall, this van is in pretty good shape for a Japanese metal box that’s approaching 30 years old. Perhaps it’s just me but I think Toyota of America needs to bring over some of those vans they’ve been hiding from us. I wouldn’t mind a Toyota TownAce MasterSurf Wagon TRD Pro. Is It Bad That I Want To Live In An Old Van?